Most popular for eating and juicing. 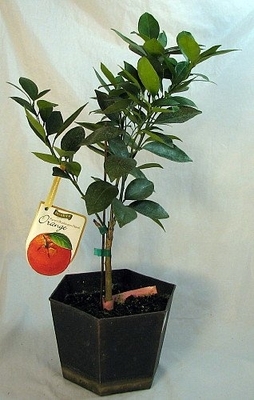 Large, bright orange, easy-to-peel, sweet and mostly seedless Patio or indoors. Loves the sun. Size shipped: Growing in 8 inch pot. Fruiting size. A single mutation in a Selecta orange tree planted on the grounds of a monastery near Bahia, Brazil, probably yielded the first navel orange between 1810 and 1820. Navel oranges were introduced in Australia in 1824 and in Florida in 1835. In 1870, twelve cuttings of the original tree were transplanted to Riverside, California, where the fruit became known as &quot;Washington&quot; The fruit is large; seedless, round and easily peeled with a pebbled rind. Today, navel oranges continue to be propagated through cutting and grafting. This does not allow for the usual selective breeding methodologies, and so all navel oranges can be considered fruits from that single, nearly two-hundred-year-old tree: they have exactly the same genetic make-up as the original tree and are, therefore, clones. Please note this tree will take approx 1-2 weeks to ship.